A Successful Rail System in L.A. Has to Help People to Get to Work, Complement Existing Bus Routes, and Serve 1,000,000 Riders a Day. 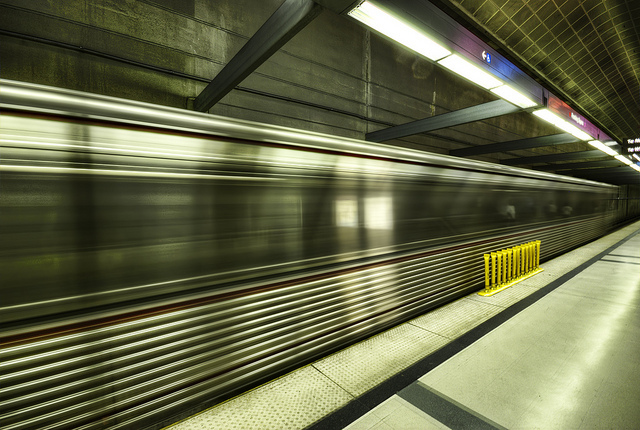 Trains will be the backbone of mass transit in L.A. Trains and rail are inseparable from California’s past. When Leland Stanford hammered “The Golden Spike” in an 1869 ceremony in Utah, he united the first transcontinental railway in the U.S.—and tied California to the rest of the country. That connection between the two coasts set the state on a path to becoming the economic and cultural force it is now. In the 21st century, California, and Southern California in particular, is once again poised to be reshaped by trains and rail lines. Public investment—from the $68 billion marked to establish a bullet train from L.A. to San Francisco to the half-cent sales tax that will, among other things, expand light rail throughout L.A. County—means more trains will be pulling into more stations throughout the region in the coming decades. In the next two years, Angelenos will be able to take the train from downtown to the beach. In advance of the Zócalo event “Are Trains the Future of L.A.?”, we asked transportation scholars, writers, and policymakers to tell us what a successful rail system would look like in Los Angeles. What kind of ridership would such a system have? And how would it affect traffic, quality of life, and commerce in Southern California? A successful rail transit system in Los Angeles will be one that gives people access to economic opportunity (jobs, healthcare, education, recreation) with less emphasis on reducing traffic congestion or simply moving people from one place to another. And Los Angeles has done a surprisingly good job getting transit to where the people are. A 2011 Brookings report found that no other metro area in the continental U.S. has better transit coverage than Los Angeles: 96 percent of workers live in neighborhoods with transit coverage. Unfortunately, only 26 percent of all jobs in the L.A. metro area are reachable by transit in under an hour and a half, a long commute even for Southern California standards. The problem is that while public transit in regions like Los Angeles serves people well, jobs remain spread out. Less than 10 percent of jobs are located within 3 miles of the two central business districts in the region (downtown L.A. and downtown Long Beach). To be sure, many of those jobs are bunched together in neighborhoods. But those places are too scattered to serve efficiently with public transit. The end result is that people have no choice but to drive in order to get to work. This is where the rail system comes in. Because of its ability to attract high-density development around stations and terminals, rail can concentrate jobs—and become a potentially attractive option for transportation. That kind of strategy won’t work for all jobs, of course. Southern California’s large warehousing, logistics, and truck driving industries may be better off in low-density areas. But by thinking of the rail system as a means to an end—in this case, economic opportunity—this massive investment can make the region stronger and help all residents share in its growth. Robert Puentes is a senior fellow with the Brookings Institution's Metropolitan Policy Program where he also directs the program's Metropolitan Infrastructure Initiative. By voting for Measure R—a sales tax increase funding a wide range of transportation projects—L.A. County citizens committed to transforming how we commute, connect, and grow with our neighbors. The Pacific Electric Red Cars system did something similar at the turn of the last century, but by the 1950s, the freeway system broke down those connections. Measure R captured the public’s imagination with 12 transit projects, including the Purple Line extension down Wilshire Boulevard, the Crenshaw/LAX corridor finally linking the rail system to the airport, and the Regional Connector subway that ties Metro’s light rail lines together—from the inland valleys to the ocean—through a single corridor in downtown L.A.
Strategic land use decisions can transform the new stations associated with these projects into activity centers combining culture, commerce, and community. The new station activity centers will enhance pedestrian and cyclist use and open the bus network to new passengers. Combined with other major transit investments–such as an expanded line through the Sepulveda Pass—these stations will allow ridership on such a rail system can to easily reach over 1,000,000 boardings a day, making it the busiest rail system in North America outside of New York City. A successful system would provide alternatives to traffic congestion and in turn the physical and emotional stress that traffic has on our health. And, a successful system would increase productivity: Each year—on average—we Angelenos lose 90 hours a year stuck in traffic. When you multiply that time by wages per hour, you realize that could add up to a lot of lost tax revenue that could have been invested into more transit and mobility alternatives. Jerard Wright is a transportation policy analyst at Move LA and has an abiding passion for transportation. He is currently co-chair of Sierra Club Angeles Chapter Transportation Committee, a member of Metro’s Citizens Advisory Council, and past co-chair of the Green LA Transportation Working Group. He graduated from the Illinois Institute of Technology with a B.A. in Architecture. A successful rail system would integrate well with current and future land uses. But trains would be just one layer of a comprehensive, multi-modal network that greatly enhances both neighborhood and regional accessibility for people all across the L.A. region. A rail network gave the region its initial form, but going forward, our transit system must integrate with low-density neighborhoods built with the automobile in mind. A comprehensive approach to transportation—including rail, buses, bikes, and other transportation services—will accommodate L.A.’s transit-oriented future without ignoring its auto-oriented past. Existing and future rail stations will form the center of complete transit-oriented neighborhoods, with housing, services such as day cares, amenities such as grocery stores, and thoughtfully designed open space. People arriving at rail stations via buses, bicycles, taxis, and shared ride services like UberPool or Lyft Line will keep these neighborhood centers free of vehicle congestion, enabling a high quality of life. A myopic focus on rail transit would shortchange much of the region. Even if we could quadruple the size of the rail transit system, this network would still fail to reach vast swaths of Southern California. A singular focus on rail would divide the region into two: neighborhoods with rail and neighborhoods without. Such a future would perpetuate income inequality as housing costs rise near stations and station areas would be choked with traffic congestion. I write this from a bus that travels from Santa Monica to Downtown Los Angeles in 35 minutes, quicker even than the future Expo Line. This serves as a reminder that getting our existing buses out of traffic is the quickest, most cost-effective means to bring high-quality transit to the greatest number of Angelenos. Juan Matute is the associate director of the UCLA Institute of Transportation Studies. He worked with Caltrans to develop a Statewide Transit Strategic Plan and currently manages TransitWiki.org, a website for sharing best practices for the future of transit in California. To answer the question, “What would a successful rail system look like in Los Angeles?”, I’m going to flip the terms. Because, for me, the more interesting and important question is, “What would Los Angeles look like with an expanded rail system?” If the city’s rail system covered a larger area and ran more frequent service at most hours, a transformed Los Angeles would be a place that thought differently about mobility, and not just in terms of the rail system alone. The exact ridership on an expanded rail system is hard to estimate. But what places that have “successful” rail systems, like New York, Chicago, and San Francisco have in common is that they aren’t just successful places for rail, but they are places that are successful for mobility. Point being, when you plan for more people on the rail system, you have to plan for more people walking to and from stations and for mobility for many modes. Jarrett Walker, of the blog Human Transit, describes rail stations as pedestrian fountains out of which people stream. This means we cannot simply think of rail transit in a vacuum. In order to have a “successful” rail system, we need to have safe facilities for pedestrians when they arrive or leave the station. To borrow a line from public health, the transit choice must be the easy choice. Giving trains priority over private vehicles, and giving pedestrians at intersections priority over cars when accessing rail stations makes the transit choice easy and safe. This connection extends to bicycles as well. The rail network should connect to a bicycle network and provide secure bicycle parking so that the two networks can work together seamlessly. In order to think about transit in Los Angeles, it’s important to get away from framing the issue around traffic and flip the question to be about mobility. Namely, how will an expanded transit network require rethinking existing transportation engineering and planning paradigms in Los Angeles? Madeline Brozen is the assistant director of the UCLA Lewis Center for Regional Policy Studies and the Institute of Transportation Studies. She is also the manager of the UCLA Complete Streets Initiative, focusing her research on issues of walking and bicycling. The Beverly Hills Unified School District will spend $9 million to fight the subway route that runs under the Beverly Hills High School campus. In South L.A. and West L.A., a specter remains of trains running at-grade and endangering communities. It’s enough to make one wonder: Is all this stress really worth it? After all, as L.A. Weekly seems to enjoy pointing out, even the expensive Westside subway will barely impact car traffic speeds on Wilshire Boulevard. I have good news. It will absolutely be worth it. L.A. is a city that outgrew its freeways a generation ago. Instead of accepting this reality, planners and politicians doubled down by spending billions of dollars to continue to grow our freeway culture. The result is a car-dependent population that yearns for faster commutes even as the streets grow more clogged with other people’s cars. It’s time for something different. People need options, and encouraging them to walk or bike isn’t going to work. The future is going to require us to provide more choices as a growing population makes car-driving-for-everyone impossible. A transit system—with trains as its backbone—will also encourage more busing, biking, and walking for anyone who needs to get from one place to the other. Not everyone will choose to ride a train, even if the stop is right outside of their front door. The key is providing a lot of transportation modes so that people can make choices. Many will still choose to drive. That’s OK too. But I choose a future that doesn’t require me to get on the 10 to get downtown or the 405 to get to my brother’s house. I suspect that many people will join me. Damien Newton is the executive director of the Southern California Streets Initiative, the nonprofit publisher of Streetsblog Los Angeles, Santa Monica Next and LongBeachIze. Newton has been honored for his work in journalism by The L.A. Press Club, the Society of Professional Journalists - Los Angeles, the American Planning Association, and L.A. Weekly. *Photo courtesy of Neil Kremer.